The Cabela's Texas Team Trail hosted its fourth and final regular season event this past weekend on Lake Lewisville, and it was the duo of Russell Lee and Hunter Jordan that went home victorious. The team crushed 17.61 pounds of largemouth bass to claim the victory, earning a Stratos 189 VLO and an upgraded 225 Mercury Pro XS for being part of the Mercury contingency. The pair also claimed the Cabela's Angler Cash award worth an extra $500 Cabela's gift card. Their total prize pot is valued over $31K. "We had an overall great day," said Lee. "It gets hot down here and heavy boat traffic is expected on Lewisville this time of year. We adapted and caught most of our fish down grassy points then switched over to boat docks in the afternoon." Russell Cecil and Todd Castledine came in second with a bag weighing 17.24 pounds, while Nathan Lintner and Mark Rose placed third with 17.22 pounds. 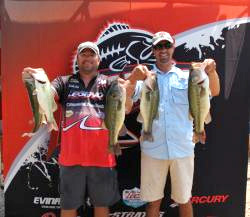 Big Bass honors, worth $525, went to Joe Setina and Lamonte Loyd with their 7.63-pound largemouth. "This has been a great year with the Texas Team Trail, Lee said. "We look forward to fishing the championship on Lake Amistad event in October." Coming down to the wire in the Lucas Oil Team of the Year race it's any teams game. Double points will be out there at the final event on Lake Amistad so the race is tight. At the conclusion of the Amistad event, custom Lucas Oil Team of the Year rings will be awarded to the winning team, along with entry fees paid for 2013. The Championship will be held on Lake Amistad on October 20-21.